An economical and versatile modular system, the Kane 9206 has been independently tested by TUV SUD to EN50379. The Kane 9206 offers users the platform they need in order to build a custom solution to solve their particular monitoring requirements. 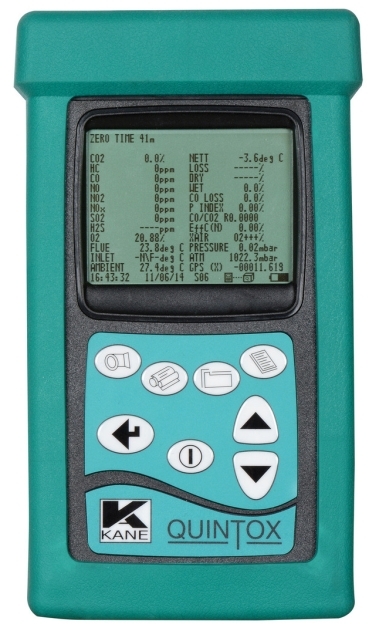 The Kane 9206 uses an electrochemical sensor in order to monitor Carbon Monoxide, Nitrogen Dioxide, Nitric Oxide, Sulphur Dioxide, Hydrogen Sulphide and Oxygen. The user can combine up to five electrochemical sensors with Kane infra-red measurement technology to monitor Carbon Monoxide (up to 10%), Carbon Dioxide and Hydrocarbons. The Kane Live software can be used to transfer your live analysis readings to the user's PC, laptop or Android Phone. Comprehensive printed reports can be produced using the integral printer or optional IR printer. Alternatively, the full report can be sent directly to an Android Phone. Wireless & USB connection to PC - Use the KANE LIVE software to monitor readings in "real time"
Built in Printer with additional output to optional portable IR printer - IR printer ideal when working away from the base unit. Differential Pressure measurement with Pitot flow calculation. This analyser uses the Kane LIVE software. Handset, Handset Cable, Base Unit fitted with Oxygen and COppm sensors), Battery Charger, Mains Lead and Manual. KHSA	Heated Toxic Sensors with dedicated battery pack for low temperature operation.